The French government's efforts to crack down on the Yellow Vest protest movement is paying off. 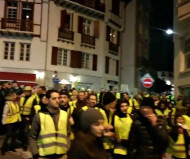 Crowds remain strong in major cities like Paris, Marseille and Toulouse as thousands gather to demand repeal of President Emmanuel Macron's anti-motorist policies, but they continue to subside throughout the rest of the nation as they see images of violent police crackdown on the demonstrations. Of particular concern is the use of GLI-F4 stun and tear gas grenades which caused one protester to lose his hand on Saturday. As the protests have disabled a majority of automated ticketing machines, officials had been hoping that new alternatives could fill in the gap. A pilot program installed photo radar devices in discrete, unmarked automobiles that blended in with traffic while issuing tickets. According to Nice-Matin, the experiment has been a flop, with the Interior Ministry concluding that the secret camera cars used since last April in Normandy have failed to produce the expected level of revenue. The ticket car fleet issued only 1873 tickets in October -- an average of six tickets per day. That compares unfavorably to the 1000 citations that a single well-placed fixed camera can generate in a month. The government nonetheless had already ordered 340 of the photo radar-equipped vehicles. The government is furiously trying to repair and replace the damaged cameras, but some are saying more needs to be done. Robert Frairet, a minor official in the Gers department, issued a letter last month to the Interior minister insisting that any speed camera that was hit by vigilante action be newly re-certified for accuracy. "As one with a highly civic and respectful approach to the rights of citizens, I am convinced that the credibility and accuracy of the results of the speed measurements require absolute proof of the reliability of a damaged device," Frairet wrote. "As a result, a new calibration certificate is needed at the technical and administrative level before any ticket is issued." In the Indre-et-Loire department, 12 of 42 speed cameras no longer functioned as of the beginning of the month. Four of the devices were taped over or covered, and eight others were destroyed by fire.